The Manitoba Child Care Association is waiting for the province to announce a child care plan that reflects public, parent, and business leader opinions. All agree the shortage of spaces is a serious issue. As of December 31, 2016 there are 14,658 children on the online child care registry waiting list. That is an increase of 2,588 waiting for a space since December 31, 2015. 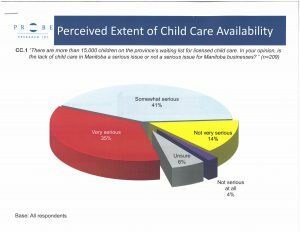 Along with an expansion of affordable and reliable licensed spaces, the child care plan must include capital and operating funding, accessible and affordable province wide training for Early Childhood Educators and a retention strategy; strong administration and governance.